1-3 year olds energy requirements are high, as they start to walk and become more active. They require lots of calories to provide them with the energy they need but they also have small stomachs and find eating large amounts difficult. It is therefore, important for them to eat 3 meals a day and 2-3 snacks in between meals to keep their energy levels up. Their meals should be based on the four main food groups – starchy carbohydrates, fruit & vegetables, protein and dairy. Making mealtimes a happy occasion is important but can be difficult if your toddler refuses to try certain foods. Read on for more information on keeping mealtimes happy. This food group includes foods such as bread, breakfast cereals, potatoes, pasta, rice and oats. These foods provide children with energy as well as providing B vitamins and fibre. Try to include one of these foods at each meal time. With adults, we would encourage eating the wholemeal varieties of these foods but with young children, these can be too filling and they may struggle to consume the calories they require. There is nothing wrong with including wholemeal varieties in their diets but it is best not to base each meal on a wholemeal starchy food whilst they are young. Fruit and vegetables provide many valuable nutrients, important to a growing child. Try to encourage your child to eat at least 5 portions a day. A portion is the amount they can fit in the palm of their hand. Eating a variety of different coloured fruits and vegetables provides a variety of nutrients. Remember, fresh, frozen, canned and dried all count towards 5 a day. Fruit juices and dried fruit are high in natural sugars which can cause tooth decay. It is best to consume these with a main meal and not to snack on them too often, in order to reduce the risk of tooth decay. You can also dilute juice with at least 50% water to further decrease the risk of tooth decay. It is normal for children to turn their noses up at many vegetables and even fruit, but keep introducing different ones to them in small portions. As they grow used to seeing them and to seeing you eat them, they are more likely to try them themselves. Milk and dairy products such as yogurts, cheese and fromage frais provide your child with a good source of calcium which is important for growing bones. They also provide fat, protein and other nutrients such as zinc and vitamin A. Children aged 1-3 years should consume at least 300ml of milk or 2 portions of dairy a day and it is preferable to give them full fat milk to ensure they get enough calories. Semi skimmed milk can be given from 2 years of age if your child is eating well. Skimmed milk and 1% milk are not recommended until 5 years of age. If your child is milk allergic or lactose intolerant then there are plenty of other foods that can provide calcium. Please click here to find out more about alternatives to milk. These foods provide protein which is important for growth as well as iron, vitamin D, zinc and B vitamins. Oily fish is also a source of omega 3 fats which are useful for brain development in children. Of course meat and fish are the most obvious proteins, but there are plenty of other good sources. Eggs, beans, lentils, pulses, tofu and meat substitutes like soya mince are alternatives to meat. Meat is a good choice for providing iron, but if your child does not eat meat or you wish them to have some meat free days, then eggs, lentils, fortified cereal and green vegetables provide some iron too. Top tip: If you feed these to your child with a glass of orange juice, the vitamin C will help them absorb more of the iron. Foods like biscuits, cakes and pastries can be included in a balanced diet, but it is important to restrict the frequency these are consumed. It is so easy to reach for the biscuits every time your child wants a snack but here are a few ideas for some alternatives, to help you break that habit. It is completely normal for toddlers to refuse certain foods from time to time and they are often reluctant to try new foods. They will however, grow out of this phase, so just ride with it and try not to worry unless your child is losing weight. Children will quite often refuse to eat if they are too tired or too hungry so ensure mealtimes are regular and give them healthy snacks in between meals to keep energy levels up. Make mealtimes interesting by presenting food in lots of different shapes and themes. A few cookie cutters are a great addition to your kitchen and there is no limit to what you can cut into a teddy bear shape! · Offer small, attractive portions and let them feed themselves as much as possible. 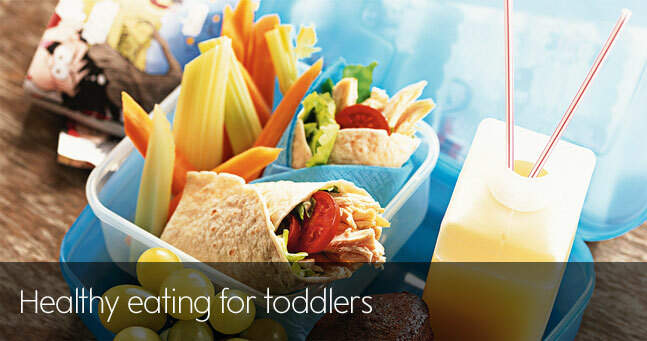 · Sit down and eat with your toddler. They learn from you. · Involve children in the preparation as far as is possible, for example mashing potatoes, decorating a pizza with vegetables or mixing fruit into yogurt.